Nellie Spindler was born in September 1891, the daughter of George and Elizabeth Spindler of 104 Stanley Road, Wakefield in Yorkshire. George was a Sergeant, and then an Inspector, with the local police force. She was baptised on the 11th November 1891 as Nellie (not Ellen or Helen). She had a sister, Lillie, who was five years younger. In 1911 Nellie was a hospital nurse at the City Fever Hospital, Park Lane, Wakefield and from 1912 to 1915 was working at the Township Infirmary, Leeds. From November 1915 until May 1917 she was a staff nurse at Whittington Military Hospital in Litchfield. Nellie Spindler then worked as a Staff Nurse with the Queen Alexandra’s Imperial Military Nursing Service, which had been formed in1902 from the Army Nursing Service of 1881. From May 1917 she was a staff nurse at Stationary Hospital in Abbeville, France. Neillie Spindler also worked as a staff nurse in No. 44 Casualty Clearing Station; a British evacuation hospital located at Brandhoek, a small hamlet between Poperinghe and Vlamertinghe. It specialised in abdominal wounds that needed to be treated urgently because of the amount of blood loss and infection. It had a high mortality rate and No 44 CCS was closer to the front line than most and was close to a railway line and munitions ‘dump’. It was shelled often as the enemy tried to destroy the rail network thus preventing more munitions reaching the front line. On the 31st July 1917 the Third Battle of Ypres began and on that day a total of 6869 casualties were registered in the four Casualty Clearing Stations and surgeons carried out 582 operations. On Tuesday, 21st August, 1917, private communications from Abbeville stated that the hospital was shelled all day and at 11 o’clock in the morning Nellie was hit, it is thought in the back, but other reports say in the chest, by shrapnel. She became unconscious immediately and although tended by her fellow nurses she died just twenty minutes later in the arms of Nurse Wood, who was also from Wakefield. The Field Hospital at Brandhoek was evacuated immediately. 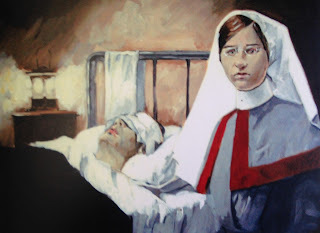 321 patients, and Nellie Spindler’s body were taken to Lijssenthoek. 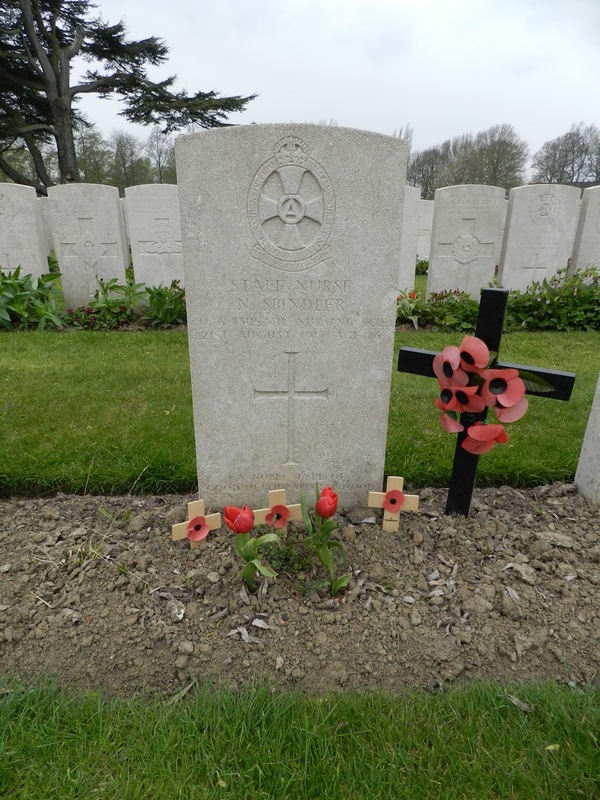 Nellie was buried, with full military honours the next day, Wednesday, 18th August 1917. The ‘Last Post’ was sounded and it is thought that over one hundred officers, four generals and the Surgeon-General attended the funeral. 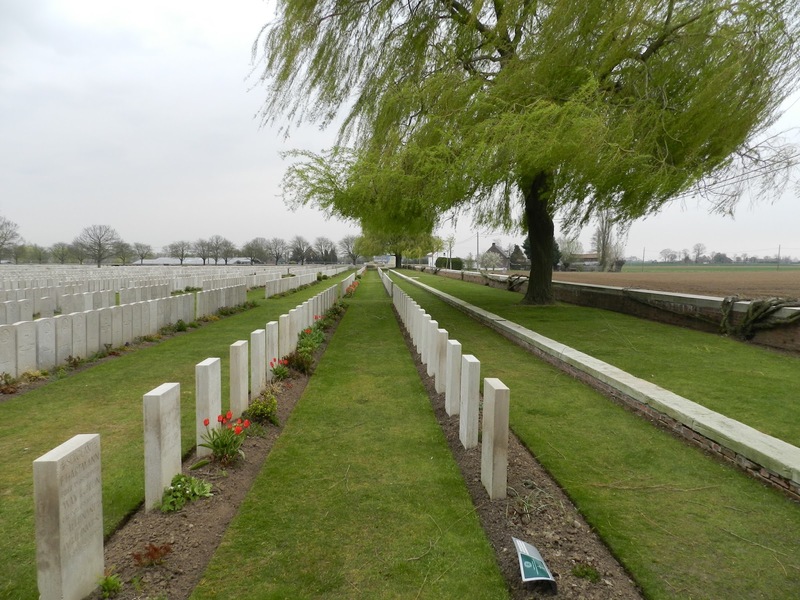 Staff Nurse Nellie Spindler is the only woman amongst 10,000 men in Lijssenthoek Military Cemetery, the second largest Commonwealth cemetery in Belgium (the largest being Tyne Cot). 9,901 British and 883 Commonwealth casualties rest there. She is also one of only two women members of the QAIMNS to be buried in Belgium, the other being Sister Elsie Mabel Gladstone who died on 24th March 1919 aged 32 and is buried in Belgrade Cemetery, near Namur, Belgium. Nurse Nellie Spindler, ‘Our Roll of Honour’ in The British Journal of Nursing, 179, September 8, 1917.